The Carina Nebula is a bright, large emission nebula surrounding the star Eta Carinae, located in the southern constellation Carina. 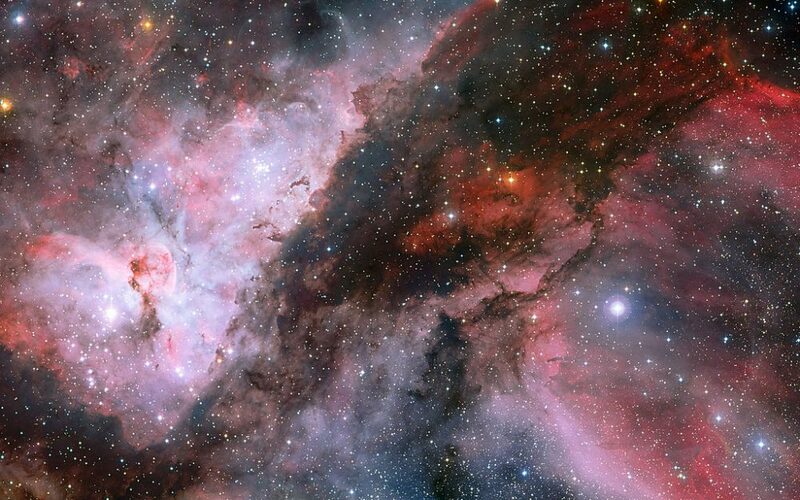 It is also sometimes called the Eta Carinae Nebula, the Grand Nebula, or the Great Nebula in Carina. 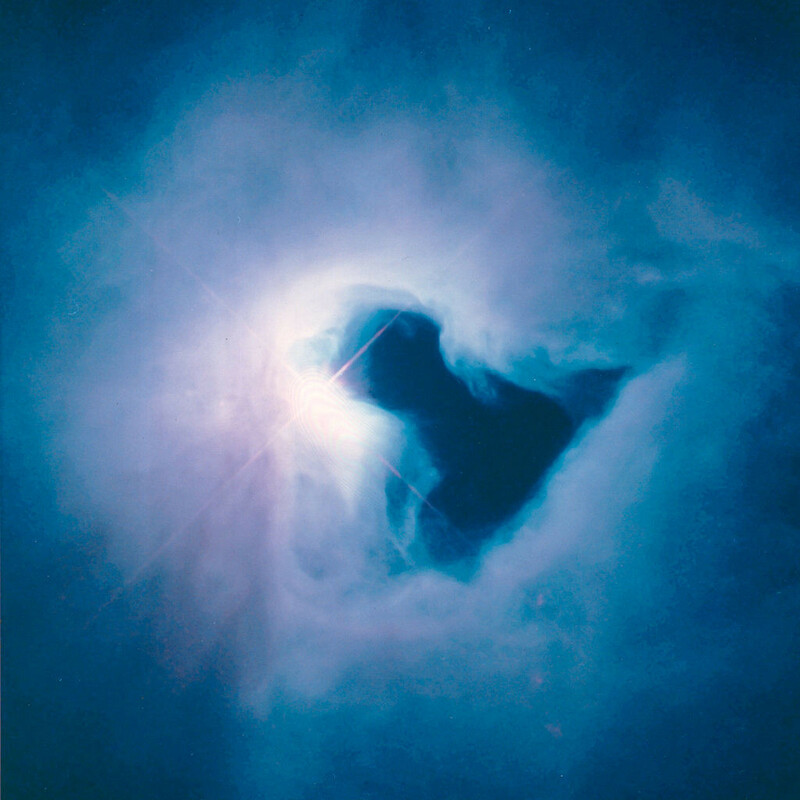 The nebula’s designation in the New General Catalogue is NGC 3372. It is one of the largest diffuse nebulae known, one that contains several open star clusters. 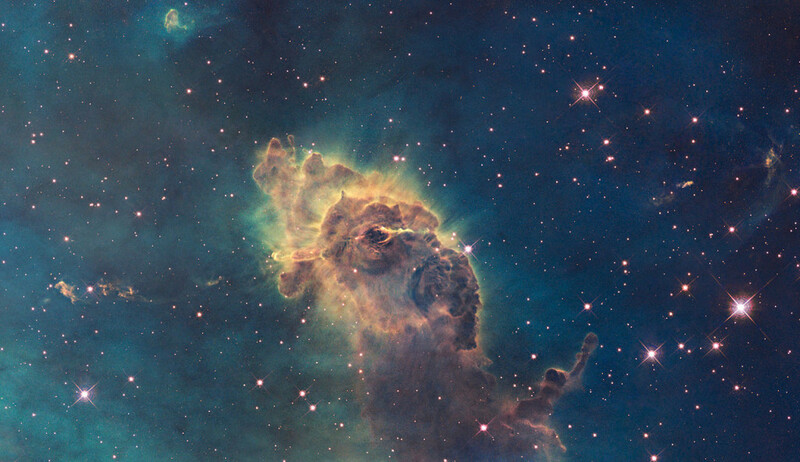 The Carina Nebula is home to several notable objects: the Mystic Mountain, the Homunculus Nebula, and the Keyhole Nebula. The Carina Nebula lies in the Carina-Sagittarius Arm of the Milky Way, at a distance between 6,500 and 10,000 light years from Earth. 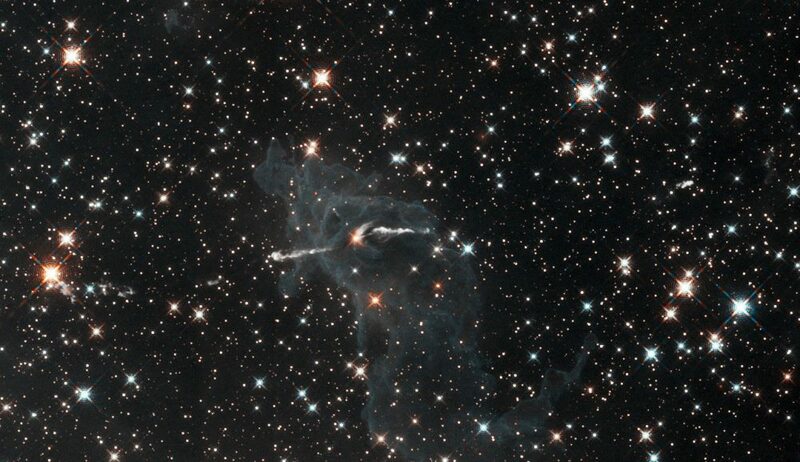 The estimated distance of the nebula is 7,500 light years. NGC 3372 is exceptionally large, about four times the size of the Orion Nebula (Messier 42). It can easily be seen without binoculars even though it is about five times more distant than the famous nebula in Orion constellation. Eta Carinae Nebula is not quite as well known as the Orion Nebula because it lies in the southern sky and can only be observed from equatorial and southern latitudes. The nebula spans about 460 light years in diameter, covering an area of three degrees of the sky. It is one of the largest known star forming regions in the Milky Way. X-ray images of the region reveal that the nebula has also been a site of multiple supernova explosions. Eta Carinae, the central star in the nebula, is a luminous supergiant, about four million times more luminous than the Sun, with 100 to 150 times the Sun’s mass. It is the most massive star that can be observed and studied in great detail thanks to its size and location. 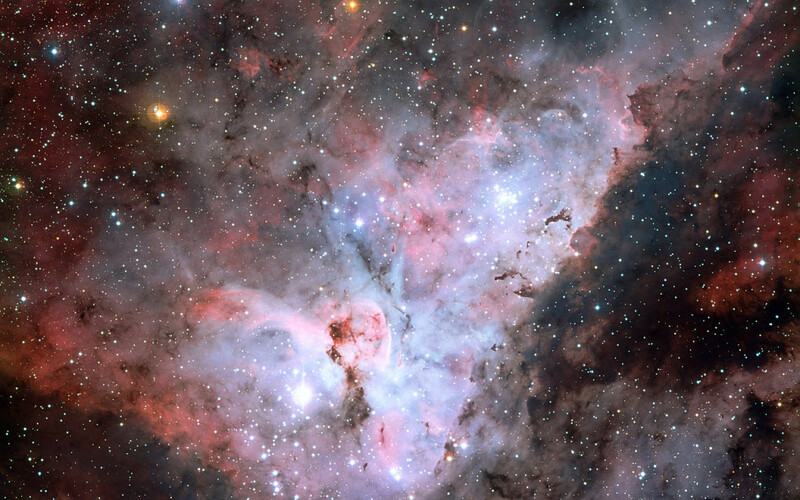 Eta Carinae is believed to be only 2 to 3 million years old. The stellar wind inside the nebula surrounding the star blows off a mass equivalent to that of Jupiter every year, which means that Eta Carinae loses 100 billion times more mass than the Sun. The star is currently in its final stages of life and will soon explode as a gigantic supernova or hypernova. This could happen within days or a million years from now, and it will likely result in the devastation of planets and starfields lying within a few thousand light years of the star. Eta Carinae is believed to be part of a binary star system, which it shares with another supergiant. The other star is thought to be between 30 and 60 times more massive than the Sun. Every 5.5 years, the two massive stars make a closest approach, coming within 2 to 3 astronomical units of each other. As a result, their stellar winds collide and there is a huge outflow of radiation and light. 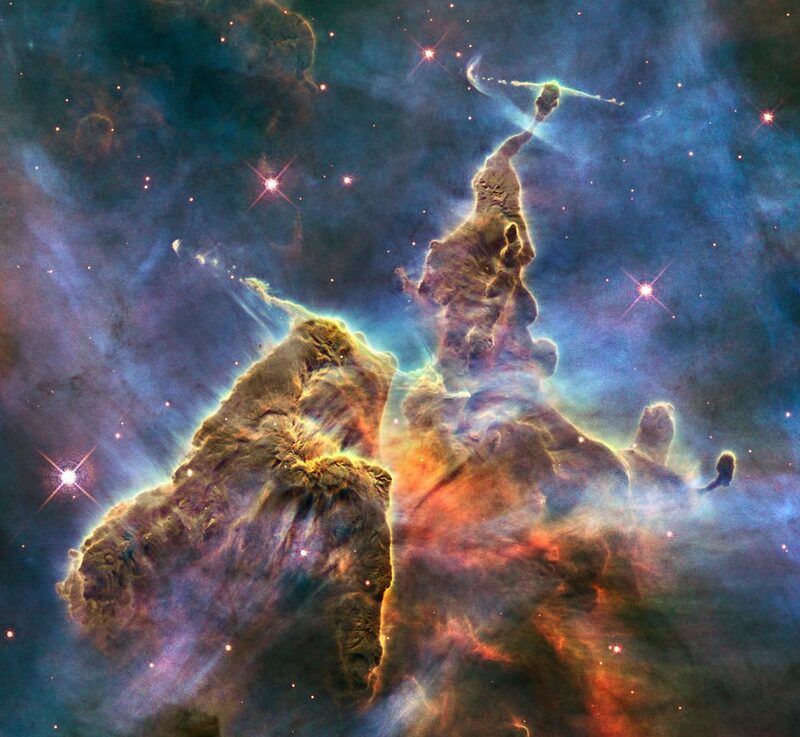 The Mystic Mountain is a pillar of gas and dust located inside the Carina Nebula. It was photographed by the Hubble Space Telescope in February 2010, on the 20th anniversary of its launch. The images show a region with a shape resembling that of a mountain top surrounded by clouds. The Mystic Mountain region is three light years in height and contains nascent stars which fire off jets of gas which can be seen streaming from the mountain peaks. The gas pillar is being slowly eroded by the light of the enormously large, massive young stars located above the pillar. The Homunculus Nebula is a much smaller region of nebulosity within NGC 3372, directly surrounding the star Eta Carinae. The name of the smaller nebula means Little Man in Latin. The Homunculus Nebula is believed to have been formed in the 1840s, when a powerful outburst briefly made the massive central star the second brightest star in the sky. The event is known as Nova Carinae 1843, or the Great Eruption. The outburst was also responsible for producing the two lobes the nebula is known for and a large, thin disk, all expanding at an approximate speed of 1 million kilometres per hour. 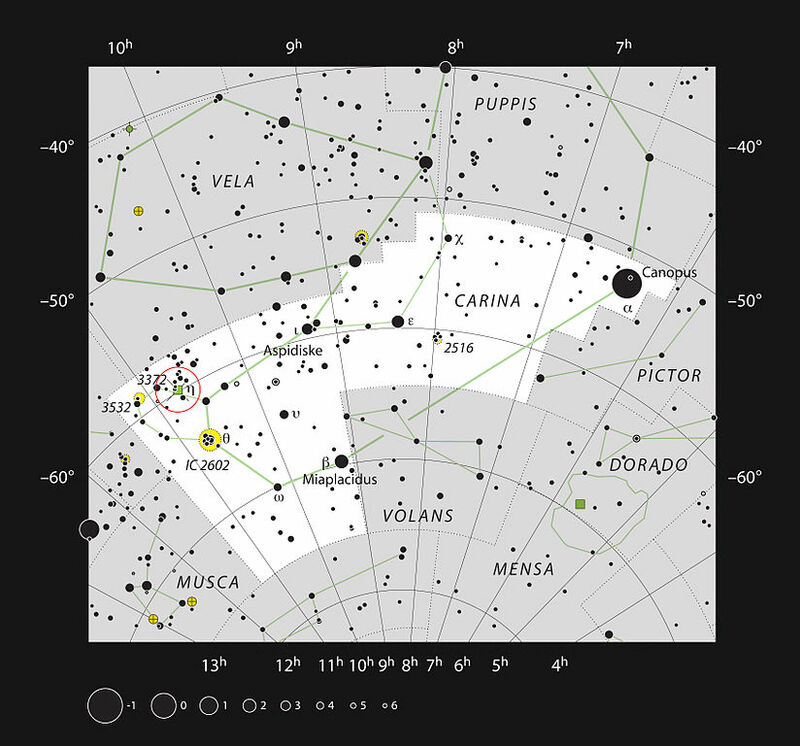 Prior to the outburst, Eta Carinae appeared as any other naked eye star, but then began to brighten and, by 1848, the star’s apparent magnitude reached its peak. The star’s brightness then gradually faded again and, by 1880, Eta Carinae could no longer be seen without binoculars. It is currently at the limit of naked eye visibility, but would appear much brighter if it were not surrounded by clouds of dust. The Keyhole Nebula is a dark nebula about seven light years in diameter. It was named for its keyhole shape, for which it is known. It lies silhouetted against the bright Carina Nebula in the background. The Keyhole Nebula was named by the English mathematician and astronomer John Herschel in the 19th century. It has its own designation in the New General Catalogue, NGC 3324. The Carina Nebula was discovered by the French astronomer Nicolas Louis de Lacaille in 1751-52, who observed the southern constellations from the Cape of Good Hope in South Africa. The Carina Nebula is home to several exceptionally bright and massive stars, including Eta Carinae and HD 93129A, and multiple O-type stars. It is known to contain at least a dozen stars with a mass at least 50 to 100 times than of the Sun. NGC 3372 contains eight open clusters, including Collider 228, Trumpler 16 and Trumpler 14. Trumpler 14 is the youngest and most populated cluster in the group. The first generation of newly formed stars in the nebula are believed to have condensed some three million years ago, igniting in the middle of a large hydrogen cloud. Radiation from these young stars shaped a bubble of hot gas, which has kept expanding ever since. The stellar winds and ultraviolet radiation within the region are compressing cold hydrogen, resulting in more new stars being formed inside the nebula. The pillars of dust and gas within the Eta Carinae Nebula will be destroyed by the young stars over the next 100,000 years and all that will remain will be a new open star cluster. 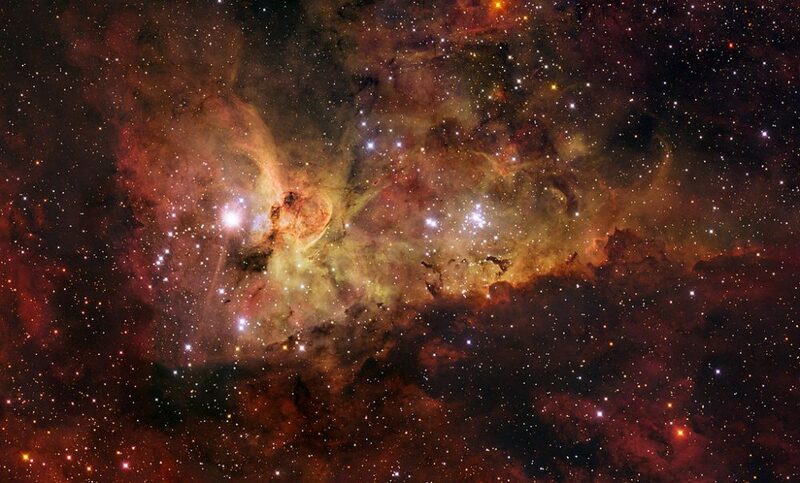 The Carina Nebula is a large bright nebula that surrounds several clusters of stars. It contains two of the most massive and luminous stars in our Milky Way galaxy, Eta Carinae and HD 93129A. Located 7500 light years away, the nebula itself spans some 260 light years across, about 7 times the size of the Orion Nebula, and is shown in all its glory in this mosaic. 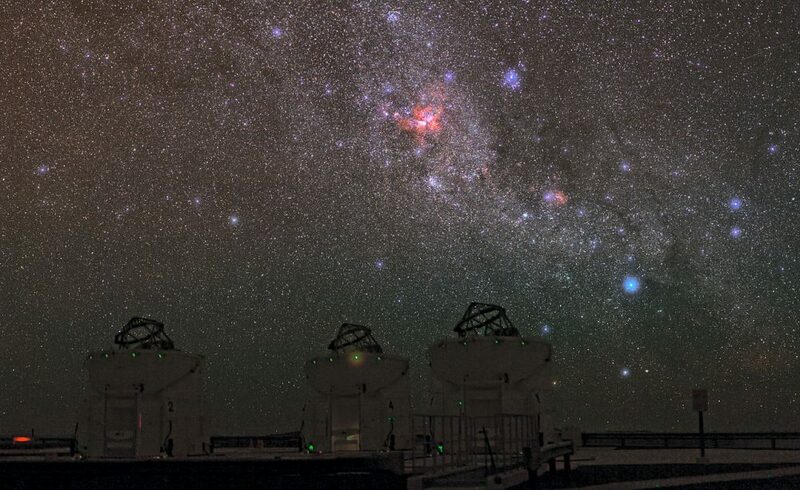 It is based on images collected with the 1.5-m Danish telescope at ESO’s La Silla Observatory. Being brighter than one million Suns, Eta Carinae (the brightest star in this image) is the most luminous star known in the Galaxy, and has most likely a mass over 100 times that of the Sun. It is the closest example of a luminous blue variable, the last phase in the life of a very massive star before it explodes in a fiery supernova. 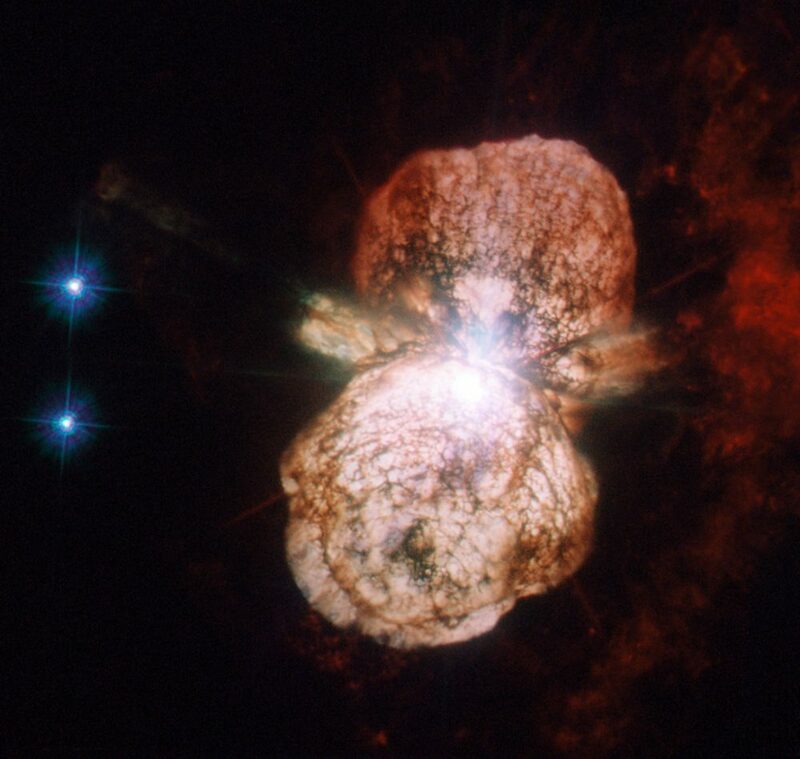 Eta Carinae is surrounded by an expanding bipolar cloud of dust and gas known as the Homunculus (‘little man’ in Latin), which astronomers believe was expelled from the star during a great outburst seen in 1843. 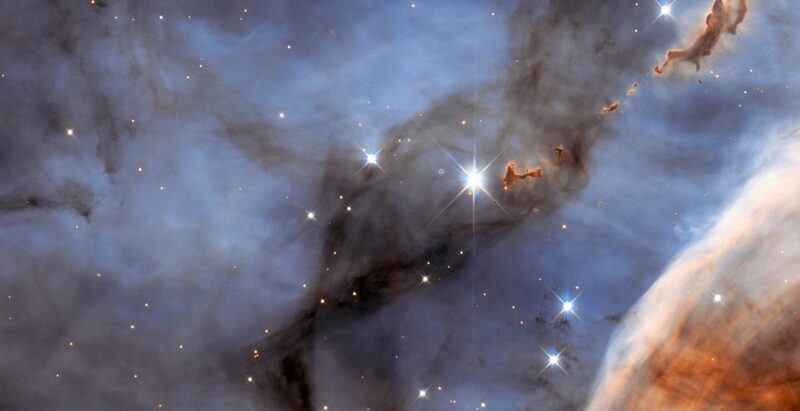 Looking like an elegant abstract art piece painted by talented hands, this picture is actually a NASA/ESA Hubble Space Telescope image of a small section of the Carina Nebula. Part of this huge nebula was documented in the well-known Mystic Mountain picture (heic1007a) and this picture takes an even closer look at another piece of this bizarre astronomical landscape (heic0707a). 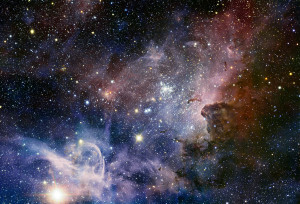 The Carina Nebula itself is a star-forming region about 7500 light-years from Earth in the southern constellation of Carina (The Keel: part of Jason’s ship the Argo). Infant stars blaze with a ferocity so severe that the radiation emitted carves away at the surrounding gas, sculpting it into strange structures. The dust clumps towards the upper right of the image, looking like ink dropped into milk, were formed in this way. It has been suggested that they are cocoons for newly forming stars. The Carina Nebula is mostly made from hydrogen, but there are other elements present, such as oxygen and sulphur. This provides evidence that the nebula is at least partly formed from the remnants of earlier generations of stars where most elements heavier than helium were synthesised. The brightest stars in the image are not actually part of the Carina Nebula. They are much closer to us, essentially being the foreground to the Carina Nebula’s background. 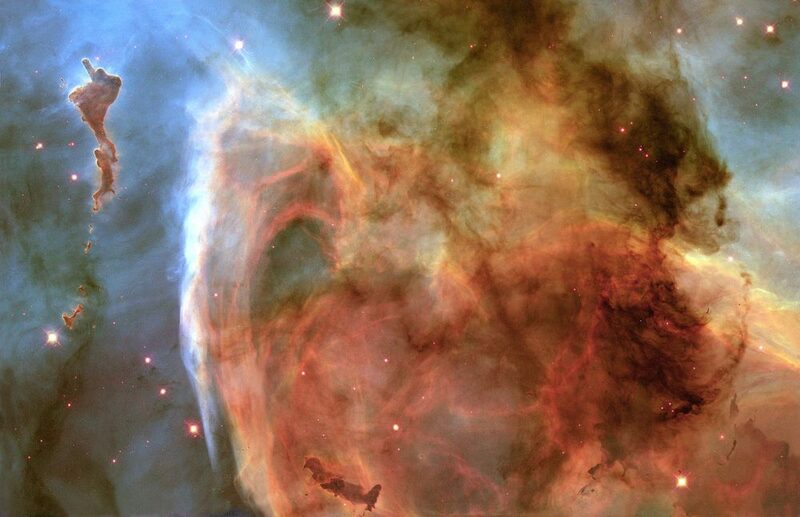 Previously unseen details of a mysterious, complex structure within the Carina Nebula (NGC 3372) are revealed by this image of the “Keyhole Nebula,” obtained with NASA’s Hubble Space Telescope. The picture is a montage assembled from four different April 1999 telescope pointings with Hubble’s Wide Field Planetary Camera 2, which used six different color filters. The picture is dominated by a large, approximately circular feature, which is part of the Keyhole Nebula, named in the 19th century by Sir John Herschel. This region, about 8000 light-years from Earth, is located adjacent to the famous explosive variable star Eta Carinae, which lies just outside the field of view toward the upper right. 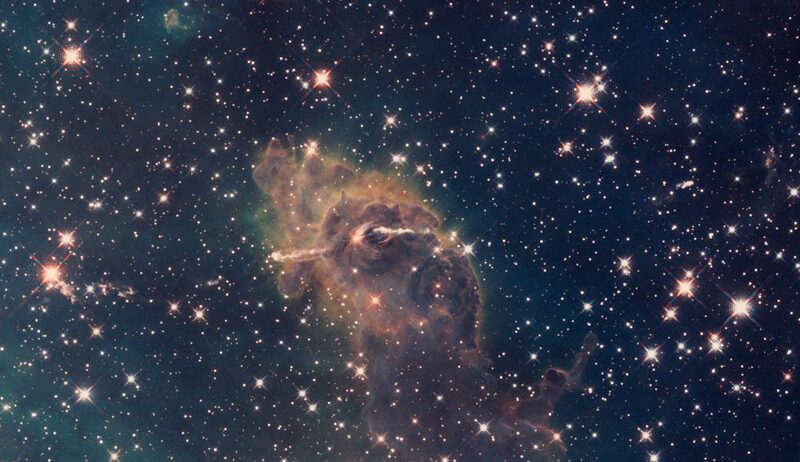 The high resolution of the Hubble images reveals the relative three-dimensional locations of many of these features, as well as showing numerous small dark globules that may be in the process of collapsing to form new stars. Two striking large, sharp-edged dust clouds are located near the bottom center and upper left edges of the image. The former is immersed within the ring and the latter is just outside the ring. The pronounced pillars and knobs of the upper left cloud appear to point toward a luminous, massive star located just outside the field further toward the upper left, which may be responsible for illuminating and sculpting them by means of its high-energy radiation and stellar wind of high-velocity ejected material. These large dark clouds may eventually evaporate, or if there are sufficiently dense condensations within them, give birth to small star clusters. The Carina Nebula, with an overall diameter of more than 200 light-years, is one of the outstanding features of the Southern Hemisphere portion of the Milky Way. The diameter of the Keyhole ring structure shown here is about 7 light-years.